The ruins don’t have anything to do with the Aztecs. It was a common 19th century misconception, like the one about the Egyptians building the Mayan pyramids because, somehow, the Mayans weren’t smart enough to build piles of rubble and put a smooth face on them. No, the ruins at Aztec, New Mexico, are one of the settlements of the Anasazi Indians, as they made their way through the Four Corners region some nine hundred years ago. 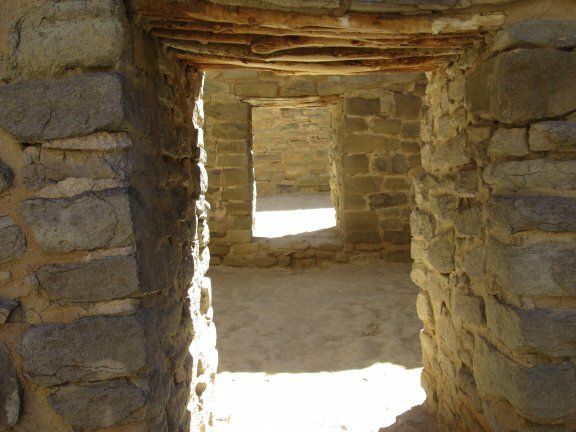 Chaco Canyon holds the most spectacular ruins, but there are numerous outliers, such as the ruins at Aztec, Salmon, Chimney Rock, Pueblo Pintado, and elsewhere. It looks as if the area went through a period of protracted drought, sending the Anasazi southeast to the valley of the Rio Grande River, to the Hopi Mesas in Arizona, and to Zuñi. There they became the twenty-odd Pueblo Indian tribes, which still exist today. They entered history abruptly in 1680, when they forcibly expelled the Spanish from New Mexico under a leader called Popé—the only North American peoples to successfully revolt—though they were reconquered some twelve years later. After that, when the United States marched in, they became more docile and did not require any army forts to keep them in line. The ruins at Aztec are quite spectacular. 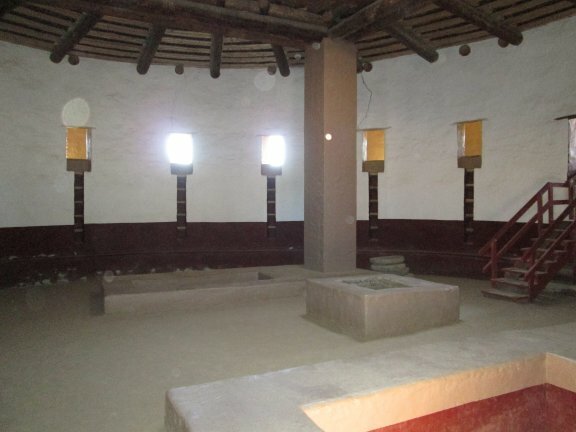 A large kiva has been restored and even today looks very church-like in a Protestant sort of way. The Pueblo tribes still visit the ruins as they think of the paths their various peoples took to find a place where they could thrive. Some day I would like to return to New Mexico and spend more time at Chaco Canyon, which at one time supported a large population before the waters dried up. In the meantime, it was interesting to see Aztec Ruins National Monument and nearby Salmon Ruins just outside of Bloomfield. This entry was posted in vacation and tagged anasazi, aztec-ruins, chaco-canyon, new-mexico. Bookmark the permalink.